How to record screen and add annotation? How to record screen on video? Screen Recorder is a Demo Creator, it is a powerful yet simple screen recording software program for Windows which allows you to capture desktop activities and create a voice-over presentation with Flash animation effect without any programming skill. What is VeryDOC Screen Recorder? VeryDOC Screen Recorder is a powerful but easy-to-use screen recording software program which can be used to record screen activities and sounds on videos or flash movies. VeryDOC Screen Recorder allows you to record desktop activities and create a voice-over presentation with Flash animation effect without any programming skill. VeryDOC Screen Recorder can create industry-standard AVI video files. VeryDOC Screen Recorder can also create MP4, FLV, MOV, etc. video files for your demo video. Free download VeryDOC Screen Recorder by clicking here and you will get the 20-times free trial version. The full version has more functions than the unregistered version. If you want to buy the full version, please click here. Create a series of training documents for the company. Record screen tutorial videos for school or college class, helping the students who need to catch up with the class. VeryDOC Screen Recorder can record what you can see, hear and do on desktop and create videos on your computer. When it is hard to explain to someone how to do something on a computer, you can use VeryDOC Screen Recorder to record what you do on video and send it to your friend, showing him/her how to do it! You can select any portion of the screen or the entire desktop for recording. 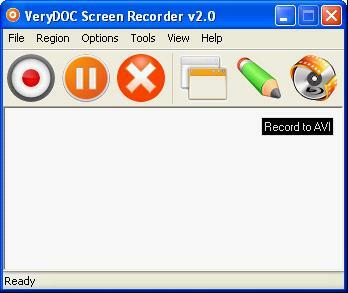 VeryDOC Screen Recorder allows users to record the entire screen area or a preset or custom area. This allows the user to zoom into one important area, avoiding recording the irrelevant elements that are not important at hand. Users can select the area by click with the mouse without interfering with the video. After you record screen on screen, you can save it as any of the following formats: AVI (Standard Video Format), SWF (Flash Movie File), ASF (Advanced Streaming Format), FLV(Flash Video Macromedia Flash), MOV(Apple’s QuickTime format), MP4(MPEG-4 Part 14), MPEG(Moving Pictures Experts Group). VeryDOC Screen Recorder is compatible with all windows systems, including Windows 2000 and later systems, both 32bit and 64bit systems. The software is easy to download and set up.